KING HUGH CÚRUCHA lived in Tir Conal, and he had three daughters, whose names were Fair, Brown, and Trembling. Fair and Brown had new dresses, and went to church every Sundav. Trembling was kept at home to do the cooking and work. They would not let her go out of the house at all; for she was more beautiful than the other two, and they were in dread she might marry before themselves. They carried on in this way for seven years. At the end of seven years the son of the king of Emania fell in love with the eldest sister. One Sunday morning, after the other two had gone to church, the old henwife came into the kitchen to Trembling, and said "It's at church you ought to be this day, instead of working here at home." "How could I go?" said Trembling. "I have no clothes good enough to wear at church; and if my sisters were to see me there, they'd kill me for going out of the house." either of them has ever seen. And now tell me what dress will you have?" "I'll have," said Trembling, "a dress as white as snow, and green shoes for my feet." Then the henwife put on the cloak of darkness, clipped a piece from the old clothes the young woman had on, and asked for the whitest robes in the world and the most beautiful that could be found, and a pair of green shoes. That moment she had the robe and the shoes, and she brought them to Trembling, who put them on. When Trembling was dressed and ready, the henwife said: "I have a honey-bird here to sit on your right shoulder, and a honey-finger to put on your left. At the door stands a milk-white mare, with a golden saddle for you to sit on, and a golden bridle to bold in your hand." Trembling sat on the golden saddle; and when she was ready to start, the henwife said: "You must not go inside the door of the church, and the minute the people rise up at the end of Mass, do you make off, and ride home as fast as the mare will carry you." When Trembling came to the door of the church there was no one inside who could get a glimpse of her but was striving to know who she was; and when they saw her hurrying away at the end of Mass, they ran out to overtake her. But no use in their running; she was away before any man could come near her. From the minute she left the church till she got home, she overtook the wind before her, and outstripped the wind behind. She came down at the door, went in, and found the henwife had dinner ready. She put off the white robes, and had on her old dress in a twinkling. When the two sisters came home the henwife asked "Have you any news today from the church?" "We have great news, said they. "We saw a wonderful grand lady at the church-door. The like of the robes she had we have never seen on woman before. It's little that was thought of our dresses beside what she had on; and there wasn't a man at the church, from the king to the beggar, but was trying to look at her and know who she was." The sisters would give no peace till they had two dresses like the robes of the strange lady; but honey-birds and honey-fingers were not to be found. Next Sunday the two sisters went to church again, and left the youngest at home to cook the dinner. After they had gone, the henwife came in and asked "Will you go to church to-day?" "I would go," said Trembling, "if I could get the going." "What robe will you wear?" asked the henwife. "The finest black satin that can be found, and red shoes for my feet." "What colour do you want the mare to be?" "I want her to be so black and so glossy that I can see myself in her body." The henwife put on the cloak of darkness, and asked for the robes and the mare. That moment she had them. When Trembling was dressed, the henwife put the honeybird on her right shoulder and the honey-finger on her left. The saddle on the mare was silver, and so was the bridle. the church, but to rush away as soon as the people rose at the end of Mass, and hurry home on the mare before any man could stop her. That Sunday the people were more astonished than ever, and gazed at her more than the first time; and all they were thinking of was to know who she was. But they had no chance; for the moment the people rose at the end of Mass she slipped from the church, was in the silver saddle, and home before a man could stop her or talk to her. The henwife had the dinner ready. Trembling took off her satin robe, and had on her old clothes before her sisters got home. "What news have you to-day?" asked the henwife of the two sisters when they came from the church. "Oh, we saw the grand strange lady again! And it's little that any man could think of our dresses after looking: at the robes of satin that she had on! And all at church, from high to low, had their mouths open, gazing at her, and no man was looking at us." The two sisters gave neither rest nor peace till they got dresses as nearly like the strange lady's robes as they could find. Of course they were not so good; for the like of those robes could not be found in Erin. When the third Sunday came, Fair and Brown went to church dressed in black satin. They left Trembling at home to work in the kitchen, and told her to be sure and have dinner ready when they came back. After they had gone and were out of sight, the henwife came to the kitchen and said: "Well, my dear, are you for church today?" "I would go if I had a new dress to wear." "I'll get you any dress you ask for. What dress would you like?" asked the henwife. "A dress red as a rose from the waist down, and white as snow from the waist up; a cape of green on my shoulders; and a hat on my head with a red, a white, and a green feather in it; and shoes for my feet with the toes red, the middle white, and the backs and heels green. The henwife put on the cloak of darkness, wished for all these things, and had them. When Trembling was dressed, the henwife put the honey-bird on her right shoulder and the honey-finger on her left, and, placing the hat on her head, clipped a few hairs from one lock and a few from another with her scissors, and that moment the most beautiful golden hair was flowing down over the girl's shoulders. Then the henwife asked what kind of a mare she would ride. She said white, with blue and gold-coloured diamond-shaped spots all over her body, on her back a saddle of gold, and on her head a golden bridle. 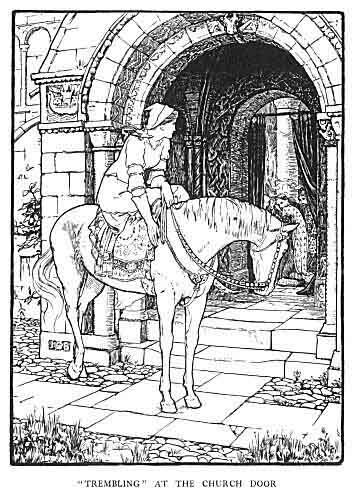 The mare stood there before the door, and a bird sitting between her ears, which began to sing as soon as Trembling was in the saddle, and never stopped till she came home from the church. The fame of the beautiful strange lady had gone out through the world, and all the princes and great men that were in it came to church that Sunday, each one hoping that it was himself would have her home with him after Mass. The son of the king of Emania forgot all about the eldest sister, and remained outside the church, so as to catch the strange lady before she could hurry away. there were three times as many outside. There was such a throng before the church that Trembling could only come inside the gate. As soon as the people were rising at the end of Mass, the lady slipped out through the gate, was in the golden saddle in an instant, and sweeping away ahead of the wind. But if she was, the prince of Emania was at her side, and, seizing her by the foot, he ran with the mare for thirty perches, and never let go of the beautiful lady till the shoe was pulled from her foot, and he was left behind with it in his hand. She came home as fast as the mare could carry her, and was thinking all the time that the henwife would kill her for losing the shoe. Seeing her so vexed and so changed in the face, the old woman asked: "What's the trouble that's on you now?" "Oh! I've lost one of the shoes off my feet," said Trembling. "Don't mind that; don't he vexed," said the henwife; "maybe it's the best thing that ever happened to you." Then Trembling gave up all the things she had to the henwife, put on her old clothes, and went to work in the kitchen. When the sisters came home, the henwife asked: "Have you any news from the church?" "We have indeed," said they, "for we saw the grandest sight today. The strange lady came again, in grander array than before. On herself and the horse she rode were the finest colours of the world, and between the ears of the horse was a bird which never stopped singing from the time she came till she went away. The lady herself is the most beautiful woman ever seen by man in Erin." son of the king of Emania said to the other kings' sons I will have that lady for my own." They all said: "You didn't win her just by taking the shoe off her foot; you'll have to win her by the point of the sword; you'll have to fight for her with us before you can call her your own." "Well," said the son of the king of Emania, "when I find the lady that shoe will fit, I'll fight for her, never fear, before I leave her to any of you." Then all the kings' sons were uneasy, and anxious to know who was she that lost the shoe; and they began to travel all over Erin to know could they find her. The prince of Emania and all the others went in a great company together, and made the round of Erin; they went everywhere,—north, south, east, and west. They visited every place where a woman was to be found, and left not a house in the kingdom they did not search, to know could they find the woman the shoe would fit, not caring whether she was rich or poor, of high or low degree. The prince of Emania always kept the shoe; and when the young women saw it, they had great hopes, for it was of proper size, neither large nor small, and it would beat any man to know of what material it was made. One thought it would fit her if she cut a little from her great toe; and another, with too short a foot, put something in the tip of her stocking. But no use; they only spoiled their feet, and were curing them for months afterwards. trying it on; and one day Trembling spoke up and said: "Maybe it's my foot that the shoe will fit." "Oh, the breaking of the dog's foot on you! Why say so when you were at home every Sunday?" They were that way waiting, and scolding the younger sister, till the princes were near the place. The day they were to come, the sisters put Trembling in a closet, and locked the door on her. When the company came to the house, the prince of Emania gave the shoe to the sisters. But though they tried and tried, it would fit neither of them. "Is there any other young woman in the house?" asked the prince. "There is," said Trembling, speaking up in the closet "I'm here." "Oh! we have her for nothing but to put out the ashes," said the sisters. But the prince and the others wouldn't leave the house till they had seen her; so the two sisters had to open the door. When Trembling came out, the shoe was given to her, and it fitted exactly. The prince of Emania looked at her and said: "You are the woman the shoe fits, and you are the woman I took the shoe from." Then Trembling spoke up, and said: "Do you stay here till I return"
her the first time said: "This is the lady we saw at church." Then she went away a second time, and a second time came back on the black mare in the second dress which the henwife gave her. All who saw her the second Sunday said: "That is the lady we saw at church." A third time she asked for a short absence and soon came back on the third mare and in the third dress. All who saw her the third time said: "That is the lady we saw at church." Every man was satisfied, and knew that she was the woman. Then all the princes and great men spoke up, and said to the son of the king of Emania: "You'll have to fight now for her before we let her go with you." "I'm here before you, ready for combat," answered the prince. Then the son of the king of Lochim stepped forth. The struggle began, and a terrible struggle it was. They fought for nine hours; and then the son of the king of Lochim stopped, gave up his claim, and left the field. Next day the son of the king of Spain fought six hours, and yielded his claim. On the third day the son of the king of Nyerfói fought eight hours, and stopped. The fourth day the son of the king of Greece fought six hours, and stopped. On the fifth day no more strange princes wanted to fight; and all the sons of kings in Erin said they would not fight with a man of their own land, that the strangers had had their chance, and, as no others came to claim the woman, she belonged of right to the son of the king of Emania. the wedding was over, the king's son brought home the bride, and when the time came a son was born. The young woman sent for her eldest sister, Fair, to be with her and care for her. One day, when Trembling was well, and when her husband was away hunting, the two sisters went out to walk; and when they came to the seaside, the eldest pushed the youngest sister in. A great whale came and swallowed her. The eldest sister came home alone, and the husband asked, "Where is your sister?" She has gone home to her father in Ballyshannon; now that I am well, I don't need her." "Well," said the husband, looking at her, "I'm in dread it's my wife that has gone." "Oh! no," said she; "it's my sister Fair that's gone." said: "If you are my wife, this sword will get warm; if not, it will stay cold." In the morning when he rose up, the sword was as cold as when he put it there. 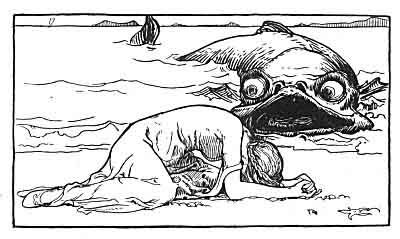 It happened, when the two sisters were walking by the seashore, that a little cowboy was down by the water minding cattle, and saw Fair push Trembling into the sea; and next day, when the tide came in, he saw the whale swim up and throw her out on the sand. When she was on the sand she said to the cowboy: "When you go home in the evening with the cows, tell the master that my sister Fair pushed me into the sea yesterday; that a whale swallowed me, and then threw me out, but will come again and swallow me with the coming of the next tide; then he'll go out with the tide, and come again with tomorrow's tide, and throw me again on the strand. The whale will cast me out three times. I'm under the enchantment of this whale, and cannot leave the beach or escape myself. Unless my husband saves me before I'm swallowed the fourth time, I shall be lost. He must come and shoot the whale with a silver bullet when he turns on the broad of his back. Under the breast-fin of the whale is a reddish-brown spot. My husband must hit him in that spot, for it is the only place in which he can be killed." When the cowboy got home, the eldest sister gave him a draught of oblivion, and he did not tell. "Did you tell the master what I told you to tell him?" "I did not," said he; "I forgot." "How did you forget?" asked she. "The woman of the house gave me a drink that made me forget." "Well, don't forget telling him this night; and if she gives you a drink, don't take it from her." As soon as the cowboy came home, the eldest sister offered him a drink. He refused to take it till he had delivered his message and told all to the master. The third day the prince went down with his gun and a silver bullet in it. He was not long down when the whale came and threw Trembling upon the beach as the two days before. She had no power to speak to her husband till he had killed the whale. Then the whale went out, turned over once on the broad of his back, and showed the spot for a moment only. That moment the prince fired. He had but the one chance, and a short one at that; but he took it, and hit the spot, and the whale, mad with pain, made the sea all around red with blood, and died. That minute Trembling was able to speak, and went home with her husband, who sent word to her father what the eldest sister had done. The father came, and told him any death he chose to give her to give it. The prince told the father he would leave her life and death with himself. The father had her put out then on the sea in a barrel, with provisions in it for seven years. In time Trembling had a second child, a daughter. The prince and she sent the cowboy to school, and trained him up as one of their own children, and said "If the little girl that is born to us now lives, no other man in the world will get her but him." they were married. The mother said to her husband "You could not have saved me from the whale but for the little cowboy; on that account I don't grudge him my daughter." The son of the king of Emania and Trembling had fourteen children, and they lived happily till the two died of old age.